QM-STVR powerful air blow gun: with 150 maximum PSI, blow stubborn debris, dust, water, and more off of all kinds of materials and machinery. 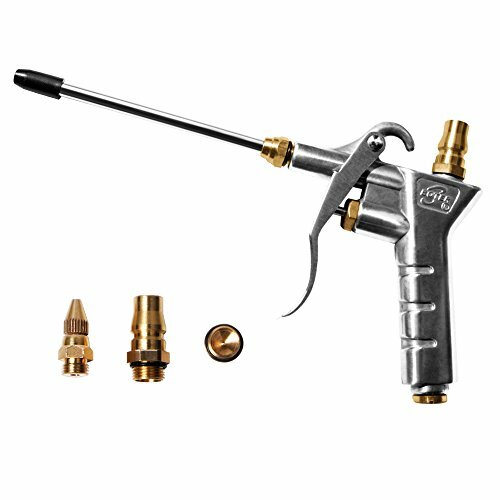 Perfect air tools gun: get to hard to reach areas with the extra-long 4.5 inch nozzle. for clearing automotive parts, computer mending, factory and any where with dust apper. Ergonomic grip hand: hand contoured grip makes it comfortable to hold and easy to squeeze the trigger. 2-way air inlet: lets you to connect the air hose form either top or bottom to suit your needs. Sturdy material--Main body is made of aluminum, corrosion resistant .